Casey Created by chloeb. This templates have specific characteristics, namely: Casey has features such as High Resolution: No, Compatible Browsers: IE7, IE8, Firefox, Safari, Opera, Columns: 2 . You can use this Casey on Blogging category for clean, customizable colors, design, flickr, flickr widget, Last FM, tumblr, tumblr theme, twitter, twitter widget, widgets and another uses. 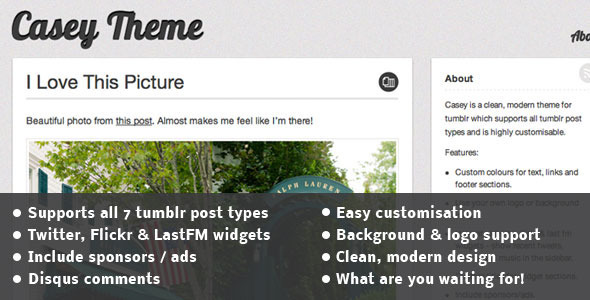 A clean, highly customisable theme for tumblr. Use your own logo or background image. Integrated twitter, flickr & last fm widgets – show recent tweets, photos and music in the sidebar. Custom titles for widget sections. Support for google analytics and disqus comments.